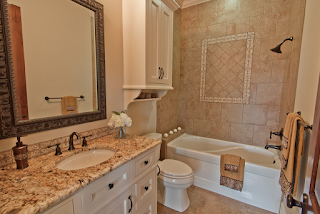 Remove everything except clean soap dish with a new bar of decorative soap and staging items. Remove and store everything possible, except bare necessities, such as you might take on a 3 week vacation. Contact paper or shelving paper should be replaced if dirty or tore. Replace all linings with new. If none then fresh paint in these areas, for buyers often peak in the drawers or under the sink. Clean toilets thoroughly. Remove all stains and calcium deposits. Seats. Any worn, stained or damaged toilet seats or lids should be replaced with new ones. They really make the toilet look so much better. Bolts – caps are often missing at the bottom edge of toilets. Put new clean bolt caps over these bolts. Cloth tank and seat covers should be removed. They are old fashion. Toilet seats should always be in a down position. No blue toilet bowl cleaners left in the tanks or toilet bowls. Water should be clear.